At the end of 2007, in a move to reverse the Caucasian country’s dwindling birth figures, the head of the Georgian Orthodox Church, Patriarch Ilia II, came up with an incentive. He promised to personally baptise any baby born to parents of more than two children. There was only one catch: the baby had to be born after the initiative was launched. The results are, in the words of the Georgian Orthodox Church, "a miracle". … The country’s birth rate increased by nearly 20% during 2008 – a rate four times faster than the previous year. The next baptism is scheduled for early April, when thousands of mums, dads and their children will cram into Tbilisi’s biggest church, the Sameba Cathedral. The babies will be briefly dipped into a gigantic inflatable font after receiving a blessing from his Holiness, Ilia II. 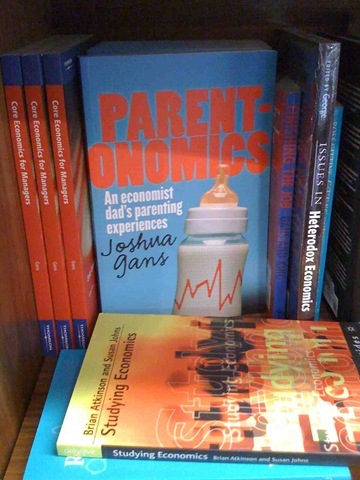 Recently, I recorded a lecture in which I tries to illustrate the 10 Lessons of Economics (from the Australian version of Mankiw’s textbook) with parenting examples. Watch it on YouTube (below) or click here for a downloadable full version. I just thought I’d alert all parents to a site, Trixie Tracker that allows parents to collect data on their babies. I have written about it today over at Game Theorist. 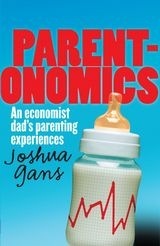 Parentonomics‘ publishers, New South, are offering a 20 percent discount for pre-orders. Click here to access the special offer. (Pre-orders are Australia and New Zealand only — news on the rest of the world hopefully very soon). Also, check out the quotes from Barry Nalebuff and Susan Athey about the book.